Welcome to Hidden River Cottage! This brand new two-storey cottage is hidden along the shore of the Pinette River with a stunning panoramic view of the beach. There is private access to the beach from the cottage, which is ideal for walks, clam-digging, and kayaking. Two kayaks are available to use. There is a large yard with a bonfire pit, an outside shower, and a beautiful deck and screened-in room overlooking the water. The downstairs has a fully-equipped kitchen, living room, one bedroom with a queen-sized bed, a porch area with washer and dryer, a full bathroom with tub and shower, and screened-in room. The screened-in room is a perfect place for dining, reading, or relaxing. There is access to the main deck from both the living room and screened-in room. On the upstairs level, in addition to the master suite, there is a landing with a desk and a futon, which can be used as extra sleeping space. The master suite has a king-sized bed and ensuite bathroom. The cottage is family-friendly and highchair and/or other baby items can be made available upon request. 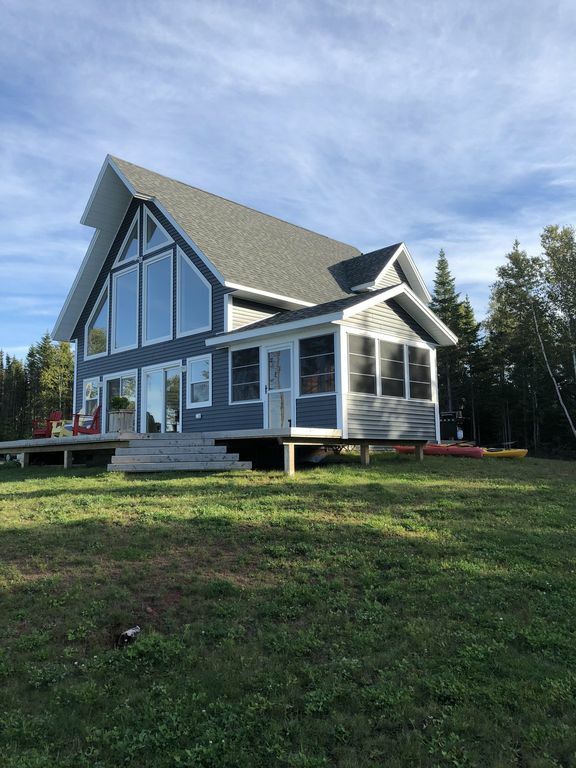 This cottage is the perfect PEI getaway for couples or families to enjoy time together by the beach, while still being close to central PEI and the Northumberland Ferry. Hidden River Cottage is located in South Pinette in eastern Prince Edward Island. Its closest community is Belfast, which is ten minutes away. In Belfast, there is a convenience store with gas, groceries, and liquor, as well as Belfast Highland Greens, a scenic 9-hole golf course. Pinette is a 35 minute to Charlottetown, PEI’s capital and largest city and a 15 minute drive to several smaller communities including Montague, Murray River, and Murray Harbour. It is 19km to the Northumberland Ferry in Wood Islands. The cottage itself is secluded, surrounded by natural woods and overlooking the Pinette River. - Point Prim Lighthouse - first and oldest lighthouse in PEI! My daughter, Sara, and I are excited to share this beautiful space with travellers coming to PEI. We are both runners and like being outdoors. Summer is a beautiful time to enjoy the island. This property is quiet, peaceful, and the perfect place for our family to enjoy in the summer and now, we are looking forward to having others enjoy it too. Eat-in kitchen with table and bar stools. Space to eat in screened-in room. Highchair available upon request.